Microsoft’s C# programming language is one of the most popular language in software industry. The SDK provided by Android supports Java and iOS asks you to use xCode platform. But now you can make applications for these two most popular mobile platforms with C#. Microsoft has made this possible by coming together with Xamarin to create cross platform mobile apps using C#. These books and SDKs can help you in this journey. Visual Studio: Microsoft’s state of the art IED, Visual Studio, now gives full support for cross platform mobile application development. Visual Studio now uses Xamarin framework to build applications for Android and iOS. If you are working on windows then you need only Visual Studio to start developing Android and iOS apps. For Mac users, Microsoft has released Visual Studio for Mac 2017. Although Visual Studio is a paid application, but you can use Visual Studio Community edition which is free for individual use, ideal for learners. Xamarin Studio: Xamarin studio is a mobile application development SDK which allows you develop native Android and iOS applications in .NET C# language. 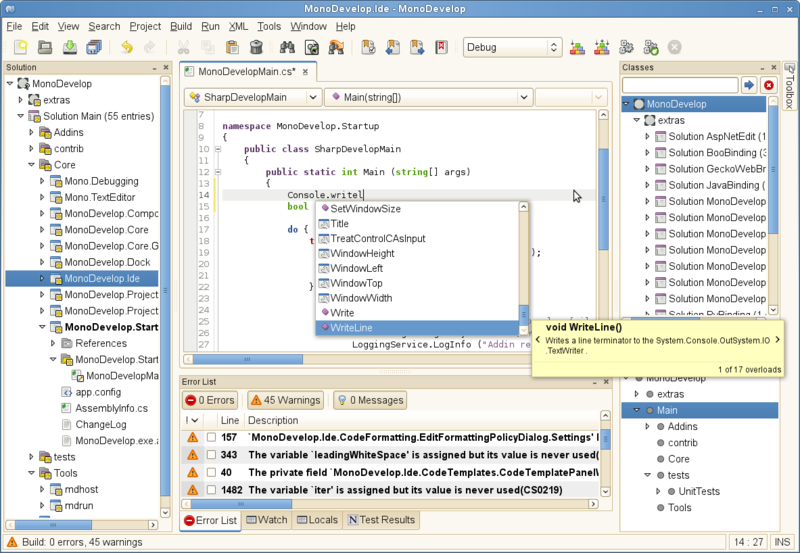 It is based on open source project MonoDevelop. It also gives you an option to integrate it with your existing visual studio 2010 or later. In 2013 Microsoft and Xamarin went into partnership to make this product more awesome. Mono For Android: Mono For Android allows developing android application using Mono. Mono is a open source implementation of Microsoft’s .NET Framework based on the ECMA standards for C# and the Common Language Runtime. It’s a add-in for open source MonoDevelop IDE which works on Linux, Windows and Mac. Xamarin mobile application development for android: This book, written by Mark Reynolds and published by packt in 2014, can help you learn to develop full featured android apps with c# and Xamarin Studio. Reader should have a good working knowledge of C#, .net framework. This book is a nice way to get started with android development on Xamarin studio. Author starts with the introduction to android and Xamarin platform. He presents all the concepts around a single application, building it completely from start to finish. For readers this approach is very engaging and easier to learn a new platform. This book have dedicated chapters on individual android concepts that are totally new for .net based developers like building UI, handling navigation and working with sensors. Xamarin Mobile Application Development : Written by Daniel Hermes and published by Apress (2015), this books shows building native Android, iOS and windows phone app with help of C# and .net framework using Xamarin studio. It shows the reader to build business apps using Xamarin.Android, xamarin.Forms and Xamarin.iOS and putting them on Google Play and the iTunes App Store. As this book came this year so you can get most updated stuffs in this book as compared to older books. Xamarin Essentials : from packt publishing (2014), this book is for Xamarin beginners who are already familier with Android and iOS development. This books aims on the Xamarin environment. If you are planning to learn xamarin programming this could be your first book. This books talks about creating Android and iOS applications to successfully deploying am application. Professional Android Programming with Mono for Android and .NET/C#: by Wrox (2012), This books teaches about making android applications with Mono for android. This can be helpful for .net and C# language programmers to fit in the android world. This book also covers CompTIA A+ exam objectives. Mobile Development with C# : by O’Reilly media in 2012, this books teaches to make native Android, iOS and windows phone app with help of C# and .net framework using MonoTouch and Mono for android. It also talks about how you can use the same codebase for all these platforms by doing some little tweaks and modifications in business logic layer. It also shows how to use external resources, reading writing filesystem and local database, accessing the geo-locations and many other advance topics. The book demonstrate all these concepts by building a series of simple small applications. If you have any book suggestion other than the books i have mentioned here, please feel free to give your valuable input. This will help us as well as others to list best book available on this subject.